For many people it’s difficult to know which coins they should own. When I asked our UK Coin Specialist he selected the 10 coins below based on a combination of their numismatic interest, design excellence and accessible value. 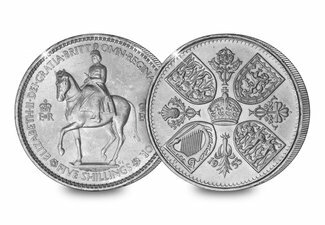 10 coins that together are some of the most iconic British coins from the last 200 years. They aren’t necessarily the best coins, but when brought together these coins create a comprehensive collection that is also affordable at under £500. This coin shares the design with one of the rarest Silver Crowns. During William IV’s reign Crowns were not issued for general circulation. But proofs and patterns were, and these are highly sought after. The obverse features the Bare Head portrait of William IV and the reverse design depicts a crowned shield on a mantle. 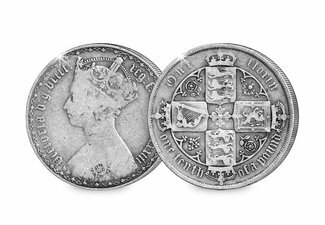 The Florin was first introduced in Queen Victoria’s reign as an early trial of decimal currency, 100 years ahead of its time. Although we are used to seeing a crowned monarch on our coinage, the portrait of Victoria wearing a crown was unusual to the general public and it was the first coin to feature a crowned monarch for over 200 years. Only two crowns were issued during the reign of King George VI. The Festival of Britain Crown was the first of these and also the first ever crown to be issued in cupronickel. The reverse of the crown features St. George slaying the Dragon, designed by Benedetto Pistrucci. Since its first issue in 1987 the 1oz Silver Britannia has become an annual staple for collectors. 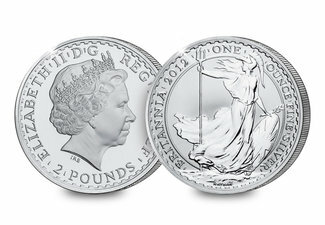 The Britannia reached its 25th anniversary in 2012 and to mark the occasion the original design by Philip Nathan featured on the reverse. It was also the last ever British coin to be struck from Britannia Silver (958/1000), a standard first introduced in 1696 Coinage Act. 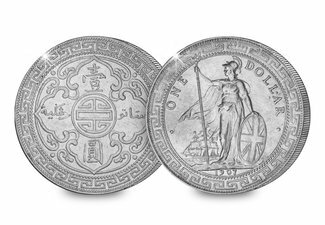 This coin was introduced in 1895 following China’s defeat in the Opium War. To ensure the acceptance of the dollar beyond British territories the design was given an Eastern look with the reverse featuring a Chinese labyrinth with the Chinese character ‘shou’ for longevity. It was demonetised in 1904, but continued to be minted until 1935. Despite being the longest reigning British Monarch, only three portraits were issued during Victoria’s reign. The first design – the Young Head – was the last penny to be struck from copper. In 1860 the switch was made from copper to bronze coinage. The reverse features a right facing seated Britannia holding a trident. 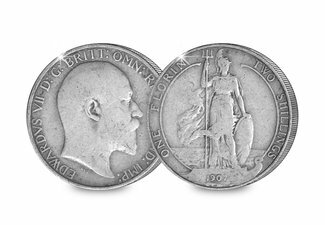 Designed by George William de Saulles, the Standing Britannia is considered by many to be one of the most attractive designs on British coins. 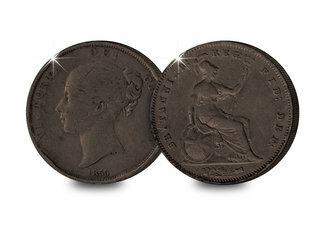 It was unusual for a coin design to change so dramatically, especially because the coinage had been static for nearly 60 years during Victoria’s reign. This was the last sixpence to be issued in silver. It has long been considered lucky. 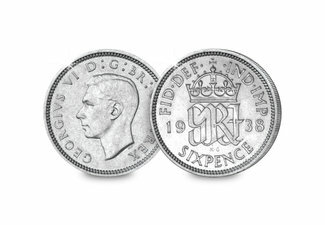 When the supply of threepence coins diminished, silver sixpences were used as a replacement in Christmas puddings. The RAF also use silver sixpences as good luck charm and have them sewn behind their wings or brevets, a custom that dates back to World War II. This was the first commemorative coin issued during Queen Elizabeth II’s reign. It was never entered into general circulation, and as a result is highly sought after by collectors. Designed by Gilbert Ledward, the Crown features the Queen riding on horseback, which is unusual for a UK issue. The world’s first 7-sided coin was introduced in 1969 to replace the 10 shilling note. The slight curved edges were designed to allow the coin to be used in vending machines without any problems. The obverse depicts Arnold Machin’s portrait of Queen Elizabeth II wearing the ‘Girls of Great Britain’ tiara. These 10 coins are now available to own as a complete set. I would rather go for the 1937 George VI Coronation crown than the 1951 issue, as it was struck in silver and not base metal. There are still many affordable silver crowns of Victoria’s reign featuring the Pistrucci “St. George and the Dragon” design, all struck between 1887 and 1901. If you want to go for a crown with a more modernistic and off-beat “St. 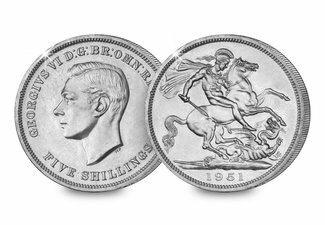 George and the Dragon” design, there is the 1935 George V Silver Jubilee issue. Hi i have a benjemin britten 50p coin what would be its true value please ? Ian, It’s really a great piece of work and I really appreciate it. I must say that it would be very handy to own a UK coin for their hobby. 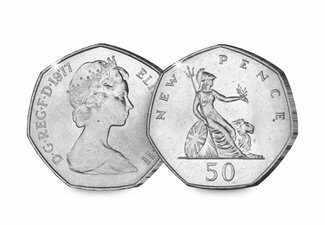 If anybody has got a 1961 50p piece (as advertised in 10 above) get in touch pronto, I will buy it…..